Few mollusks are found in aquariums, and they are not often available commercially. Among the gastropods, the cowries, well known to collectors of shells, can be kept in captivity. Some fish may nibble the "mantle", the part of the animal's body used outside the shell. 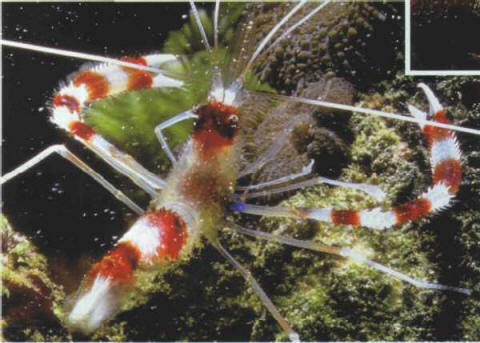 Shrimps play an ecological role by feeding on fishes' leftovers. Of course, in the event of any danger the animal retreats into its shell. Hobbyists enchanted by the beauty of this shell can put a specimen in a tank containing small Pacific fish (Gobiids, Blenniids, Grammids. Pseudochromis, for example). In the bivalve group there is the famous giant clam, which can sometimes grow up to a length of 1 m in the wild, where it feeds on vegetal plankton. Some smaller species can be acclimatized in an aquarium. However, these animals are only recommended for experienced hobbyists.